Before the existence of Burkey Glass, the Carriage & Shoeing Shop was located on the corner of Jefferson and Apple Street. You can see the railroad tracks located in the bottom left corner of the picture. Left is Reed's Opera House in 1945. 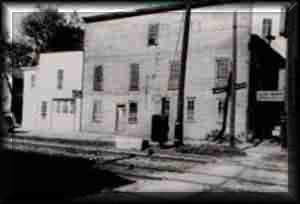 Paul Burkey (Founder) set up his first radiator shop in the white washed portion on the left. 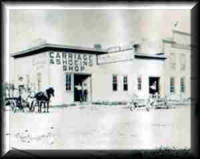 The carriage shop was built over and became part of the opera house. Burkey started out as a radiator repair shop in 1946. In 1956 brother Floyd joined in partnership. Not too many partnerships could last the 30 years Paul (Left) & Floyd (Right) had, especially when it's family. They earned a good reputation for providing excellent service and honesty throughout the years. Today Burkey Glass has grown into a full service glass shop from auto glass to just about any flat glass. House window replacement has grown every year since 1986. We strive to keep the good reputation that Paul and Floyd had built. Our philosophy is simple, "Do the job right, use high quality products, charge a fair price and the people will keep coming back!